'Blackfish' Takes Aim At SeaWorld : 13.7: Cosmos And Culture Ahead of the opening of the movie Blackfish, commentator Barbara J. King considers the dispute between SeaWorld and the filmmakers and talks with the author of the book Death at SeaWorld for his perspective. 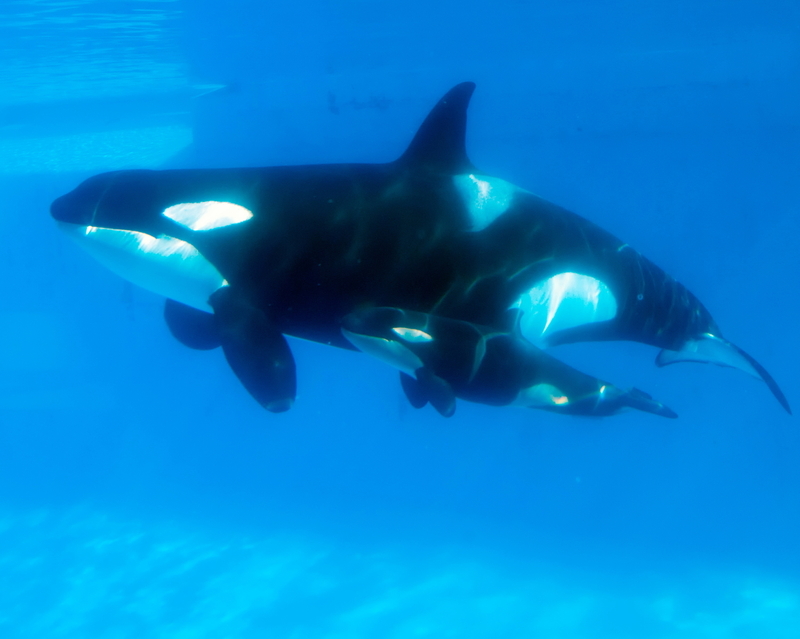 In a photo released by SeaWorld San Diego, Kasatka, a killer whale who is approximately 37 years old, swims with her newborn calf in February 2013. Blackfish, a movie opening Friday in New York and Los Angeles, takes aim squarely at theme parks like SeaWorld where captive dolphins, including orcas or killer whales, perform in entertainment shows for the public. "Nothing at [SeaWorld] is what it seems," Blackfish director Gabriela Cowperthwaite has said, as reported in The Boston Globe. I have not yet seen the film, which goes to wide release in subsequent weeks and will air this fall on CNN. Judging from the trailer and other advance material, Blackfish focuses heavily on the 2010 death of SeaWorld-Orlando trainer Dawn Brancheau caused by the orca called Tilikum. Blackfish claims that the psychological stress of captivity and being made to perform caused Tilikum (and other cetaceans as well) such stress that severe trauma and aggression is the result. For its part, SeaWorld released a statement on Saturday calling Blackfish "shamefully dishonest, deliberately misleading, and scientifically inaccurate." SeaWorld made a case against the film in a series of 8 points, and the filmmakers have responded. Last year at 13.7, I wrote about another incident, this time at SeaWorld-San Diego in 2006, in which an orca named Kasatka pulled trainer Ken Peters under the water repeatedly (Peters survived). For that post, I turned to David Kirby's book Death At SeaWorld, and this week I invited Kirby to participate in a Q&A with me about Blackfish. Our exchange, which was conducted by email, went like this. Barbara: What impact do you hope Blackfish will have on the movie-going public? David: I hope it will make movie-goers think; though how you could leave the theater without thinking about the plight of captive orcas is beyond me. This movie — and this terrible saga of marine mammal display — makes us question and judge ourselves, as humans and consumers of entertainment. The verdict is still out on us, but Blackfish presents its evidence powerfully and wrenchingly. Many people are on the fence about killer whale captivity — they won't be after seeing this movie. Barbara: Can you help us make sense of the debate between SeaWorld and the makers of Blackfish about the accuracy of the movie's content? David: It was one of the clumsiest, most ill-advised acts of corporate crisis-management [by SeaWorld] I've seen in decades — think New Coke — and it's driving ticket sales, and sales of my book, so it already backfired. SeaWorld listed 8 complaints, all of them easily disputable. It suggested, among other things, that orcas live as long in captivity as the wild — false; that SeaWorld orcas are not bullied by tank-mates — false; that SeaWorld orca families are not broken up unnecessarily — false; and that trainers were warned about the dark history of Tilikum, who did not "attack" Dawn Brancheau when he killed her — false and patently false. I wrote my own rebuttal [available online]. Barbara: The stance taken in your book and also in the movie is a strong one against SeaWorld. Do you believe that the public is beginning, or will begin, to look differently at SeaWorld and similar cetacean parks? David: My book is not against SeaWorld, nor is Blackfish, per se. The message is against keeping killer whales in captivity, wherever they are held. SeaWorld does do work with animal rescue, conservation, and outreach to local schools, though contributions to science and to the education of park guests are meager, at best. But the public is getting the message that captivity is wrong, and Blackfish will really help. Besides, SeaWorld can survive and thrive without live whales and dolphins. Look at the hugely popular Monterrey Aquarium in California: Not a cetacean in sight, by design. It's a good point that David makes: For theme parks, certainly, not a cetacean in sight, by design, is the desirable wave of the future.